All these biases are more likely to affect small studies than large ones. The smaller a study the larger the treatment effect necessary for the results to be significant. The greater investment of time and money in larger studies means that they are more likely to be of high methodological quality and published even if their results are negative. Bias in a systematic review may therefore become evident through an association between the size of the treatment effect and study size—such associations may be examined both graphically and statistically. Funnel plots were first used in educational research and psychology.11 They are simple scatter plots of the treatment effects estimated from individual studies (horizontal axis) against some measure of study size (vertical axis). Because precision in estimating the underlying treatment effect increases as a study's sample size increases, effect estimates from small studies scatter more widely at the bottom of the graph, with the spread narrowing among larger studies. In the absence of bias the plot therefore resembles a symmetrical inverted funnel (fig 1 (left)). Reporting bias—for example, because smaller studies showing no statistically significant beneficial effect of the treatment (open circles in fig 1 (left)) remain unpublished—leads to an asymmetrical appearance with a gap in the bottom right of the funnel plot (fig 1 (centre)). In this situation the combined effect from meta-analysis overestimates the treatment's effect. 14 15 Smaller studies are, on average, conducted and analysed with less methodological rigour than larger ones, so that asymmetry may also result from the overestimation of treatment effects in smaller studies of lower methodological quality (fig 1 (right)). Other sources of funnel plot asymmetry are discussed elsewhere.19 Because publication bias is only one of the possible reasons for asymmetry, the funnel plot should be seen as a means of examining “small study effects” (the tendency for the smaller studies in a meta-analysis to show larger treatment effects). The presence of funnel plot asymmetry should lead to consideration of possible explanations and may bring into question the interpretation of the overall estimate of treatment effect from a meta-analysis. In some circumstances the possible presence of bias can be examined through markers of adherence to treatment, such as drug metabolites in patients' urine or markers of the biological effects of treatment such as the achieved reduction in cholesterol concentration in trials of cholesterol lowering drugs. If patients' adherence to an effective treatment varies across trials this should result in corresponding variation in treatment effects. Scatter plots of treatment effect against adherence should be compatible with there being no treatment effect at 0% adherence, and so a simple regression line should intercept the vertical axis at zero treatment effect. If a scatter plot indicates a treatment effect even when no patients adhere to treatment then bias is a possible explanation. Such plots provide an analysis that is independent of study size. 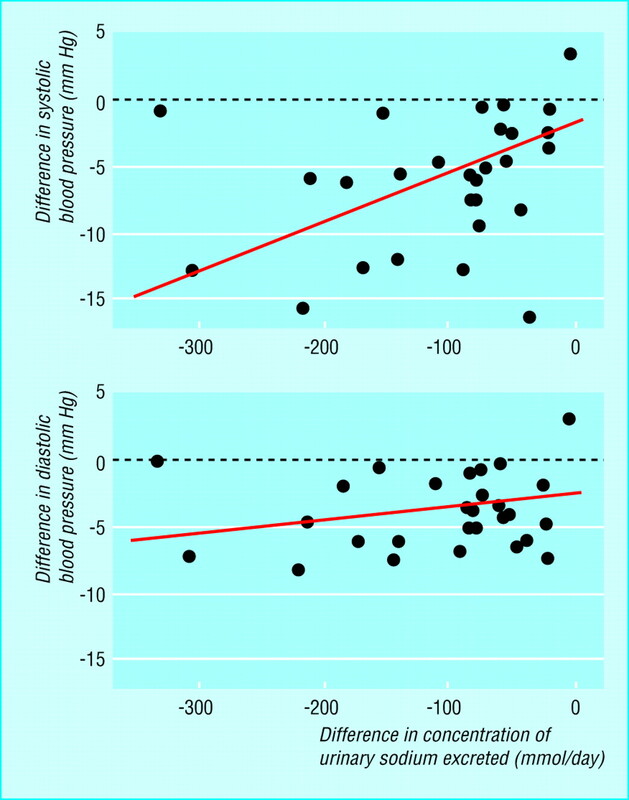 For example, in a meta-analysis of trials examining the effect of reducing dietary sodium on blood pressure Midgley et al plotted the reduction in blood pressure against the reduction in urinary sodium concentration for each study and performed a linear regression analysis (fig 2).20 The results show a reduction in blood pressure even in the absence of a reduction in urinary sodium concentration, which may indicate the presence of bias. “Selection models” to detect publication bias model the selection process that determines which results are published, based on the assumption that the study's P value affects its probability of publication.21–23 The methods can be extended to estimate treatment effects, corrected for the estimated publication bias,24 but avoidance of strong assumptions about the nature of the selection mechanism means that a large number of studies is required so that a sufficient range of P values is included. Published applications include a meta-analysis of trials of homoeopathy and correction of estimates of the association between passive smoking and lung cancer. 25 26 The complexity of the methods and the large number of studies needed probably explains why selection models have not been widely used in practice. Duval and Tweedie have proposed “trim and fill”; a method based on adding studies to a funnel plot so that it becomes symmetrical.30–32 Smaller studies are omitted until the funnel plot is symmetrical (trimming). The trimmed funnel plot is used to estimate the true “centre” of the funnel, and then the omitted studies and their missing “counterparts” around the centre are replaced (filling). This provides an estimate of the number of missing studies and an adjusted treatment effect, including the “filled” studies. A recent study that used the trim and fill method in 48 meta-analyses estimated that 56% of meta-analyses had at least one study missing whereas the number of missing studies in 10 was statistically significant.33 However, simulation studies have found that the trim and fill method detects “missing” studies in a substantial proportion of meta-analyses, even in the absence of bias.34 Thus there is a danger that in many meta-analyses application of the method could mean adding and adjusting for non-existent studies in response to funnel plot asymmetry arising from nothing more than random variation. Is the effect of homoeopathy due to the placebo effect? The funnel plot of the 89 trials is clearly asymmetrical (fig 3 (top)), and both the rank correlation and the weighted regression tests indicated clear asymmetry (P<0.001). The authors used a selection model to correct for publication bias and found that the odds ratio was increased from 0.41 (95% confidence interval 0.34 to 0.49) to 0.56 (0.32 to 0.97, P=0.037). 22 24 They concluded that the clinical effects of homoeopathy were unlikely to be due to placebo.25 Similar results are obtained with the trim and fill method (fig 3 (bottom)), which adds 16 studies to the funnel plot, leading to an adjusted odds ratio of 0.52 (0.43 to 0.63). These methods do not, however, allow simultaneously for other sources of bias. It may be more reasonable to conclude that methodological flaws led to exaggeration of treatment effects in the published trials than to assume that there are unpublished trials showing substantial harm caused by homoeopathy (fig 3 (bottom)). The table shows the results from meta-regression analyses of associations between trial characteristics and the estimated effect of homoeopathy. Results are presented as ratios of odds ratios: ratios of less than 1 correspond to a smaller odds ratio for trials with the characteristic and hence a larger apparent benefit of homoeopathy. For example, in univariable analysis the ratio of odds ratios was 0.24 (95% confidence interval 0.12 to 0.46) if the assessment of outcome was not adequately blinded, implying that such trials showed much greater protective effects of homoeopathy. In the multivariable analysis shown in the table there was clear evidence from the asymmetry coefficient that treatment effects were larger in smaller studies and in studies with inadequate blinding of outcome assessment. There was also a tendency for larger treatment effects in trials published in languages other than English. The largest trials of homoeopathy (those with the smallest standard error) that were also double blind and had adequate concealment of randomisation show no effect. The evidence is thus compatible with the hypothesis that the clinical effects of homoeopathy are completely due to placebo and that the effects observed in Linde et al's meta-analysis are explained by a combination of publication bias and inadequate methodological quality of trials. We emphasise, however, that these results cannot prove that the apparent benefits of homoeopathy are due to bias. Prevention is better than cure. In conducting a systematic review and meta-analysis, investigators should make strenuous efforts to find all published studies and search for unpublished work. The quality of component studies should also be carefully assessed.10 The box shows summary recommendations on examining for, and dealing with, bias in meta-analysis. Selection models for publication bias are likely to be of most use in sensitivity analyses in which the robustness of a meta-analysis to possible publication bias is assessed. Funnel plots should be used in most meta-analyses to provide a visual assessment of whether the estimates of treatment effect are associated with study size. Statistical methods may be used to examine the evidence for funnel plot asymmetry and competing explanations for heterogeneity between studies. The power of these methods is, however, limited, particularly for meta-analyses based on a small number of small studies. The results of such meta-analyses should always be treated with caution. Statistically combining data from new trials with a body of flawed evidence does not remove bias. However there is currently no consensus to guide clinical practice or future research when a systematic review suggests that the evidence to date is unreliable for one or more of the reasons discussed here. If there is clear evidence of bias, and if sensitivity analyses show that this could seriously affect a review's conclusions, then reviewers should recommend that some or all of the evidence to date be disregarded. Future reviews could then be based on new, high quality evidence. Improvements in the conduct and reporting of trials, prospective registration, and easier access to data from published and unpublished studies 45 46 mean that bias will hopefully be a diminishing problem in future systematic reviews and meta-analyses. We thank Klaus Linde and Julian Midgley for unpublished data. .Publication bias in clinical research.Lancet1991;337:867–872. .Factors influencing publication of research results: follow-up of applications submitted to two institutional review boards.JAMA1992;263:374–378. .Publication bias: evidence of delayed publication in a cohort study of clinical research projects.BMJ1997;315:640–645. .Language bias in randomised controlled trials published in English and German.Lancet1997;350:326–329. .Reference bias in reports of drug trials.BMJ1987;295:654–656. .Cholesterol lowering trials in coronary heart disease: frequency of citation and outcome.BMJ1992;305:15–19. .Impact of covert duplicate publication on meta-analysis: a case study.BMJ1997;315:635–640. .Multiple publication of reports of drug trials.Eur J Clin Pharmacol1989;36:429–432. .Problems and limitations in conducting systematic reviews. In: Egger M, Davey Smith G, Altman DG eds.Systematic reviews in health care: meta-analysis in context2nd ed.London: BMJ Books,2001. .Assessing the quality of controlled clinical trials.BMJ2001;322:000–000. .Summing up: the science of reviewing research.Cambridge: Harvard University Press,1984. .A note on graphical presentation of estimated odds ratios from several clinical trials.Stat Med1988;7:889–894. .Funnel plots for detecting bias in meta-analysis: guidelines on choice of axis.J Clin Epidemiol 2001 (in press). .Bias in meta-analysis detected by a simple, graphical test.BMJ1997;315:629–634. .Factors affecting the comparability of meta-analyses and the largest trials results in perinatology.J Clin Epidemiol1997;50:997–1002. .Who benefits from medical interventions? Treating low risk patients can be a high risk strategy.BMJ1994;308:72–74. .An evidence based approach to individualising treatment.BMJ1995;311:1356–1359. .Comprehensive geriatric assessment: a meta-analysis of controlled trials.Lancet1993;342:1032–1036. .Investigating and dealing with publication and other biases. In: Egger M, Davey Smith G, Altman DG eds.Systematic reviews in health care: meta-analysis in context2nd ed.London: BMJ Books,2001. .Effect of reduced dietary sodium on blood pressure. A meta-analysis of randomized controlled trials.JAMA1996;275:1590–1597. .An approach to assessing publication bias prior to performing a meta-analysis.Stat Sci1992;7:237–245. .Modeling publication selection effects in meta-analysis.Stat Sci1992;7:246–255. .Selection problems and the file drawer problem.Stat Sci1988;109-35. .A general linear model for estimating effect size in the presence of publication bias.Psychometrika1995;60:419–435. .Are the clinical effects of homoeopathy placebo effects? A meta-analysis of placebo-controlled trials.Lancet1997;350:834–843. .Publication bias in meta-analysis: a Bayesian data-augmentation approach to account for issues exemplified in the passive smoking debate.Stat Sci1997;12:221–250. .What works? : selectivity models and meta-analysis.J R Stat Soc A1999;162:95–109. .Reanalysis of epidemiological evidence on lung cancer and passive smoking.BMJ2000;320:417–418. .Publication bias in meta-analysis.Stat Sci1997;12:241–244. .Practical estimates of the effect of publication bias in meta-analysis.Aust Epidemiol1998;5:14–17. 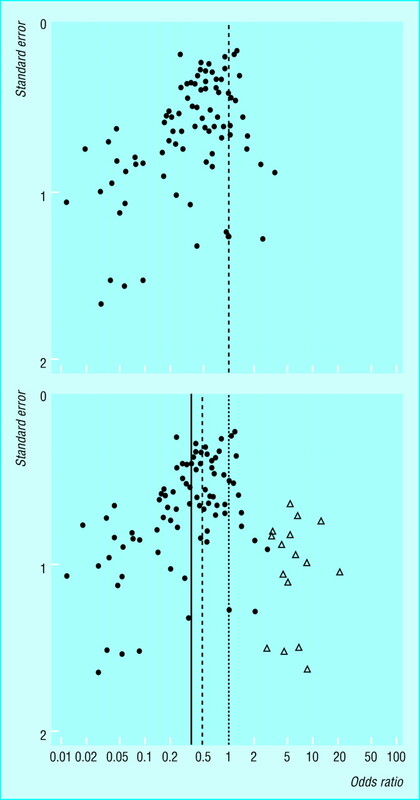 .Trim and fill: a simple funnel plot based method of testing and adjusting for publication bias in meta-analysis.Biometrics 2001 (in press). .A non-parametric “trim and fill” method of assessing publication bias in meta-analysis.J Am Stat Assoc 2001 (in press). .Empirical assessment of effect of publication bias on meta-analyses.BMJ2000;320:1574–1577. .High false positive rate for trim and fill method [rapid response to (http://www.bmj.com/cgi/eletters/320/7249/1574#EL1)] (accessed 30 March 2001). .Operating characteristics of a rank correlation test for publication bias.Biometrics1994;50:1088–1101. .Publication and related bias in meta-analysis: power of statistical tests and prevalence in the literature.J Clin Epidemiol2000;53:1119–1129. .Explaining heterogeneity in meta-analysis: a comparison of methods.Stat Med1999;18:2693–2708. .Why and how sources of heterogeneity should be investigated. In: Egger M, Davey Smith G, Altman DG eds.Systematic reviews in health care: meta-analysis in context2nd ed.London: BMJ Books,2001. .Uses of ecologic analysis in epidemiologic research.Am J Public Health1982;72:1336–1344. .Meta-analysis for the evaluation of potential surrogate markers.Stat Med1997;16:1965–1982. .CD4 cell count as a surrogate endpoint in HIV clinical trials: a meta-analysis of studies of the AIDS Clinical Trials Group.AIDS1998;12:1823–1832. .Homoeopathy trials: going nowhere.Lancet1997;350: 824. .The CONSORT statement: revised recommendations for improving the quality of reports of parallel group randomized trials.Lancet 2001 (in press). .Identifying randomised trials. In: Egger M, Davey Smith G, Altman DG eds.Systematic reviews in health care: meta-analysis in context2nd ed.London: BMJ Books,2001.